I need to edit HSB curved. I know there is a filter to convert from and to HSB here. The problem is that I am not able to see the preview as long as I edit, I need first to apply the filter (the image will become all "weired"), do the curve trasnformation and then apply the fiter again to see the final result. Is there any better way of doing this? 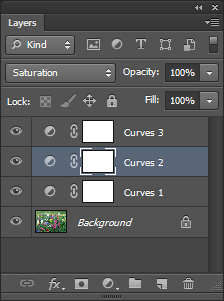 Maybe you can take advantage of the fact that Adjustment Layers can have a Blend Mode? 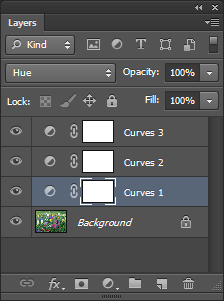 This way you can manipulate hue, saturation and luminosity separately. How can I manually create amp-files for curves adjustment layers in Photoshop?